This report is your guide to the steadily growing Washington State market for products high in Cannabidiol, more commonly known as CBD. Second only to THC, CBD is the most well-known and well-studied of the many cannabinoid molecules found in cannabis. It has very different effects on users than THC, and is especially popular among medical cannabis patients for its various therapeutic effects. Though high-CBD products currently make up only a fraction of the total cannabis market, interest in CBD products is definitely rising. Various factors are driving the increase demand, including recent legislation combining the recreational and medical markets in Washington State, as well as increasing consumer awareness of CBD. High-CBD products seem to be popular among some of the newer cannabis users, including women and older consumers, though more data is needed to confirm the link between age and interest in CBD. 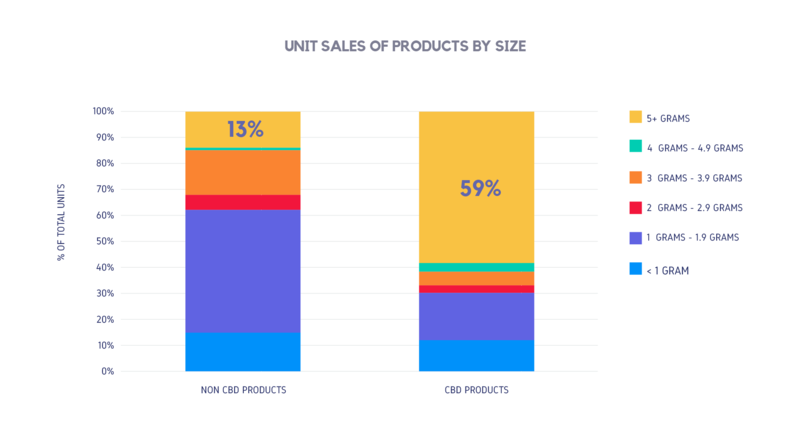 In this report, we take a look at some of the 832 high-CBD products in our product catalog, seeing which ones are most popular, which product categories high-CBD products perform best in, and who’s buying high-CBD products. There are, by some estimates, in the area of 200 unique cannabinoid molecules that naturally occur in the cannabis plant. However, THC usually takes top billing, as it is the one primarily responsible for the psychoactive properties of the plant, though CBD is also becoming a well-known component of the cannabis experience. It produces more distinctly physical effects, and is not psychoactive at all. In fact, it binds to the same cannabinoid receptor that THC does, which means that it can often inhibit the “high” feeling from THC in a blended CBD/THC product. It can be incredibly effective in reducing anxiety, relieving pain, and helping users to relax. In this way, it has come to be popular in the recreational market in products that often mimic the effects of popular over-the-counter drugs. Topicals, for example, are a very popular format for high-CBD products, as they often prove more effective than a commercially available “rub” for sore joints and taxed muscles. However, its chief use is in medical cannabis regimens. It has shown promise in treating everything from neuropathic pain to cancer to epilepsy, and is being intensely scrutinized by large drug companies for its use in medication. Indeed, Britain recently allowed a low-THC, high-CBD cannabis oil to be sold for the treatment of seizures. Here in Washington, the state’s medical cannabis market was recently folded into the recreational one, which is likely driving that increased demand, along with increased consumer awareness and product offerings. However, it’s still difficult to tell if the market conversion will drive a spike in CBD sales, as many of the state’s more serious medical patients still distrust the recreational system. The state did see a surge in overall sales after the July implementation date, but that was likely due to recreational users who possessed a medical cannabis authorization returning to the recreational market. Additionally, there are some confusing market forces at work in the realm of CBD. For one, producers and processors are allowed to import industrial CBD oil from outside of the state, as it is not regulated in the same way as THC. Thus, many order large vats of CBD oil that is produced from Chinese industrial hemp, and cut that into their products. This makes it difficult for those who grow and extract CBD locally to compete, and consumers aren’t currently educated enough to have a preference for “homegrown” CBD products. Many processors also argue that industrial hemp lacks the cannabinoid profile needed to yield the full benefits of CBD. Ultimately, importation makes it extremely difficult to determine the true fair market value for high-CBD flower, and artificially suppresses the price of high-CBD products, which could explain some of the data showing lower basket totals for CBD purchases in this report. Beyond that, the use of imported CBD has contributed to the general wariness of the recreational market among medical patients, who are generally better educated than the average consumer and understandably more concerned about the purity of the products they buy. Whether you’re looking to market to the recreational, “just want to relax” user or a medical patient, understanding the characteristics, purchasing habits, and priorities of CBD users is key to entrepreneurs looking to enter the marketplace. Data for this report comes from real-time sales reporting by participating Washington State cannabis retailers via their POS systems which are directly integrated with Headset. This report is based on data collected from retailers between September 2015 and September 2016. That data is cross-referenced with our catalog of over 60,000 products to provide detailed information on market trends. All products in this report are marketed as CBD products by the manufacturer or retailer. botanicaSEATTLE, a major Washington processor, also submitted commentary on the CBD market from within the industry. Headset.io’s data is very reliable, as it comes digitally direct from our partner retailers and our product manufacturing partners. However, the potential does exist for misreporting in the instance of duplicates, incorrectly classified products, inaccurate entry of products into POS systems, or even simple human error at the point of purchase. Thus, there is a slight margin of error to consider. We examined the buying habits of over 40,000 individuals participating in loyalty programs across Washington to determine our demographic data. In Washington, there are about 832 different products that are distinguished as CBD. Those products accounted for 2.8% of total sales, 2.4% of total units sold, and about $5.7 million of the market last year. 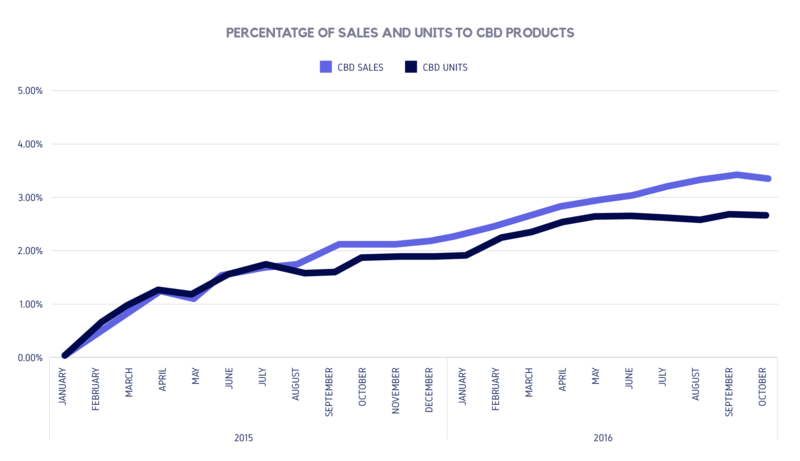 Since January of 2015, the sales of CBD products have steadily increased, and are currently a little over 3% of the total market. One of the most important things to note about CBD buyers is that the buy in bulk. About 59% of CBD flower purchases are 5+ gram purchases, which could be associated with people buying it with the intent to use daily for its various therapeutic purposes. 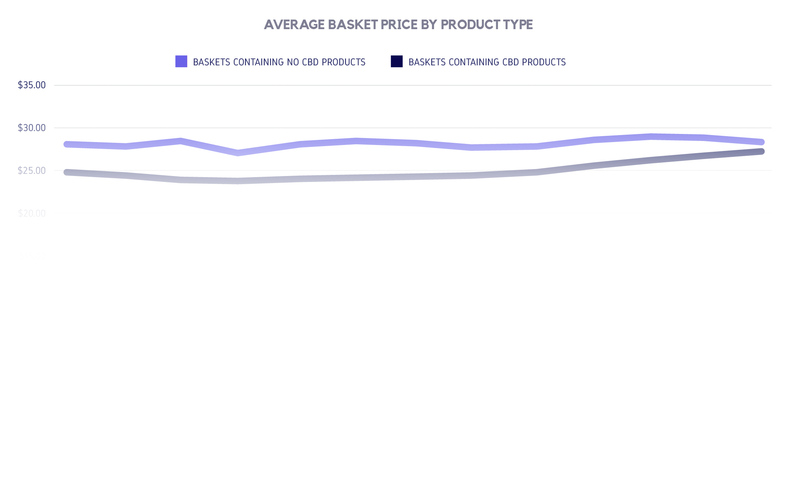 Alternatively, the overall basket price is slightly lower, likely because of those issues around CBD product valuation. However, that gap is slowly closing in recent months.